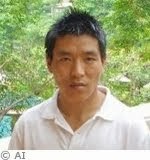 Dhondup Wangchen was released from prison on June 5, 2014, and taken to his sister’s home in China’s inland Qinghai province, where he expressed his desire to be reunited with his wife and their four children, who currently reside in the United States. Wangchen was detained in March 2008, shortly after filming the documentary “Fear No More,” which showed interviews with Tibetan people discussing the Dalai Lama, the Chinese government, and various other social issues. Dhondup was unable to appeal his sentence because he was denied the right to an attorney until his right to appeal had expired. During his detainment, Dhondup has been subjected to torture. In 2012, Wangchen was awarded the International Press Freedom Award by the US-based Committee to Protect Journalists.